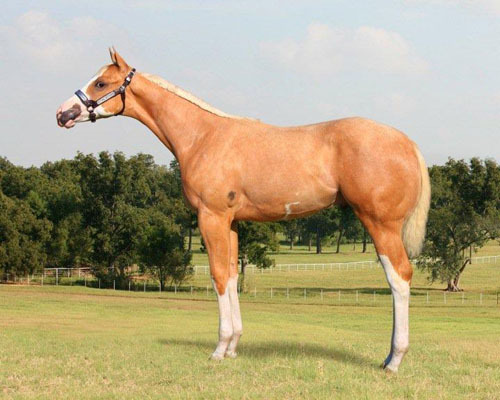 2013 double registered AQHA/APHA palomino colt. We have been searching for many years for a double registered colt that not only had to be HYPP NN but also had to pass the other tests for Pssm1, MH, GBed & Herda which are all negative and as well as being overo negative (OLWS neg) and to make it even harder I really wanted any other colour apart from chestnut or sorrel so there were certainly some boxes that needed to be ticked so when everything just fell into place I really believe someone was watching over us. 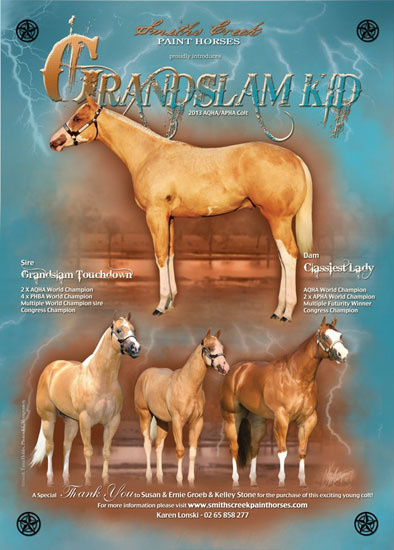 'Grandslam Kid' is not only an outstanding individual but he has an extremely awesome and a strong pedigree. 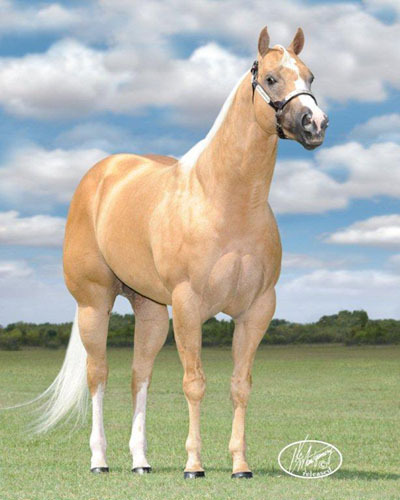 His sire 'Grandslam Touchdown' is a 2 x Open AQHA World Champion & 4 x Palomino World Champion & AQHA Congress Champion and he has sired Multiple World & Congress Champions. 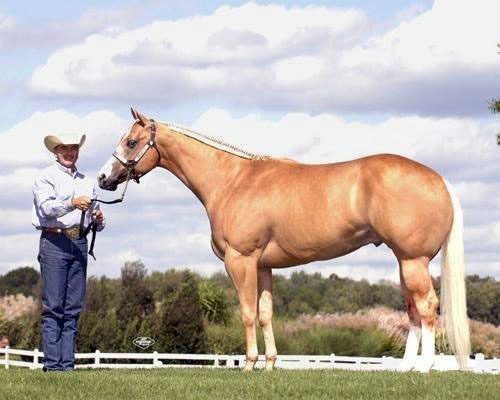 Grandslam Kid's dam is the phenomenal mare 'Classiest Lady' an Open AQHA World Champion, AQHA Congress Champion and a 2 x APHA World Champion. 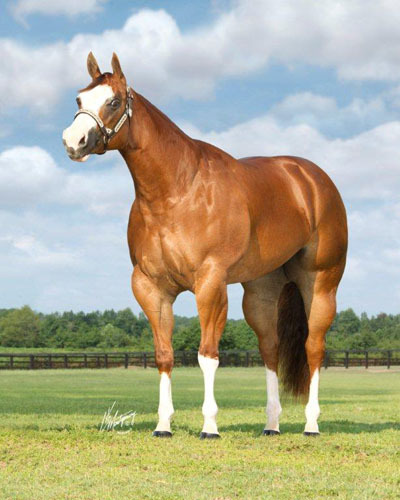 Not only is there such strength in both sire and dam but the depth in his pedigree goes on and on with many World Champions in both top and bottom. 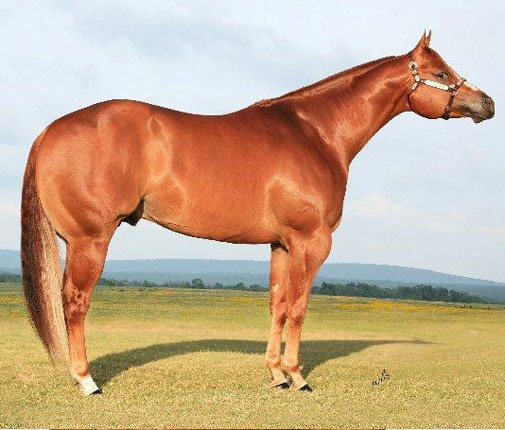 'Classiest Lady' is by the stunning 'I Gotta Cool Secret' who is an Open AQHA Reserve World Champion and the sire of countless World & Reserve World and Congress Champions in both AQHA and APHA. 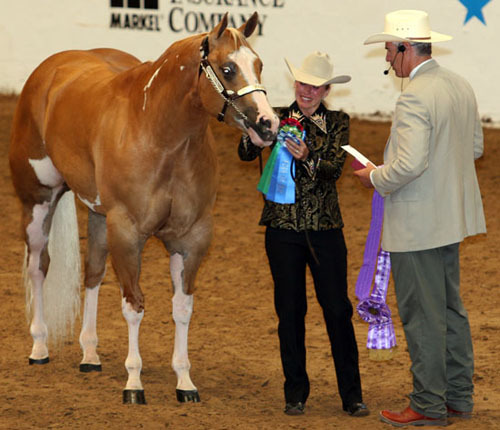 'Classiest Lady' is out of 'Kids Classic Lady' a mare I had the privelidge to see in lifeand she is an 8 x APHA World Champion and she is by 'Kids Classic Style'. It isn't hard to see why I am just so excited!!! 'Grandslam Kid' will stay in the USA to be fitted and shown by Diamond2M Show Horses for a few years before coming to Australia but I can hardly wait! I would like to sincerely thank Ernie & Susan Groeb for giving Craig and I this awesome opportunity to purchase such an incredible colt and to Kelley Stone for all your guidance and dedication to helping our dreams come true.